This recipe for Sambal Glazed Chicken Wings comes to us from Chef Lucas Castle, Executive Chef with Compass Group at the Ontario Legislative Assembly, Queen’s Park. Yorkshire Valley Farms recently served up a batch of these wings at the Peterborough Day event at Queen’s Park, a wonderful affair designed to showcase local businesses and producers from the Peterborough area. The wings were most certainly a hit with the attendees – there was not one wing left to spare by the end of the event! 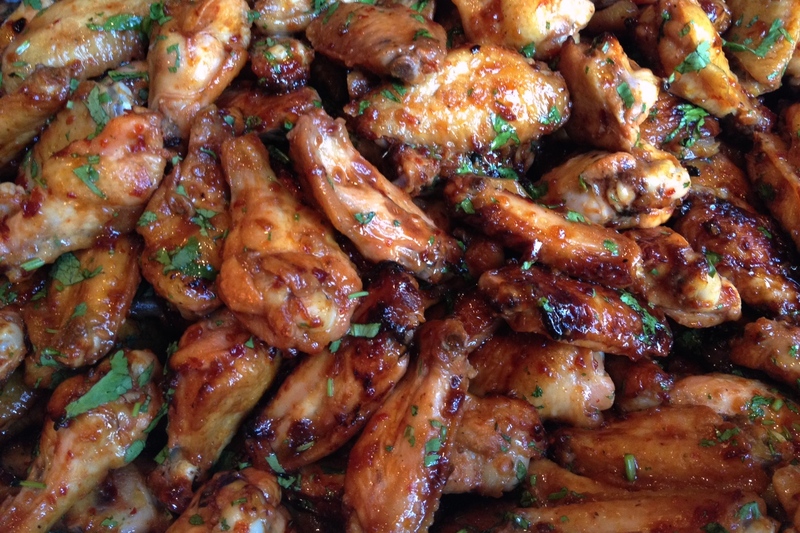 Chef Lucas was kind enough to share his culinary secrets so that we can all enjoy these tasty wings at home. Preheat oven to 375ºF (190ºC). In a heavy bottom pot, whisk brown sugar, rice vinegar, chili paste, fish sauce, and ginger. Bring to a boil, reduce heat, and simmer until sauce has reduced by half (about 1 cup). Toss chicken with 3/4 of sauce and roast in oven. After 10 minutes, turn the chicken and baste with remaining marinade. Finish cooking through, approximately another 10 minutes, or until internal temperature reaches 185ºF (85ºC). The glaze should caramelize and become a deep reddish-brown. If there is any remaining marinade, drizzle over top of the cooked wings. Season with kosher salt and pepper if needed. Garnish with chopped fresh cilantro and crushed salted peanuts.